Short Synopsis: “Those fools at the Science Institute, who expelled me for my unethical experiments, will be shocked when they see how my android robot will help mankind.” – Doctor Droid. Yeah, sure they will. Doctor Droid is your typical mad scientist – the kind that says “la-bor-a-tory” all stretched out. He also has a not-as-smart-as-him, Peter Lorre-sounding assistant named Boris. 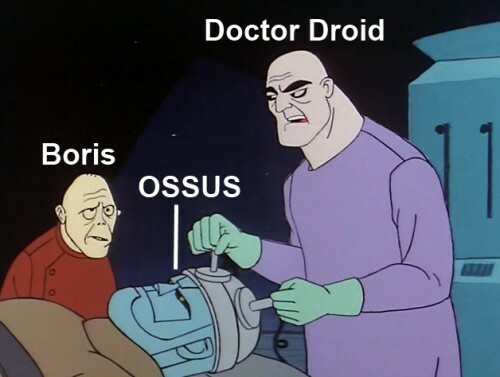 The plan, in the Boris’ words, “once you put the brainwaves of this trained white mouse into the android’s circuits, you will have created an obedient super strong untiring servant!” To save myself some time, we will nickname it OSSUS. And don’t go naming your kids that. I call it. I see, so the reason mice do not rule over all dominion is because they are small and covered in fur. For example, when you find mice in your trashcan, it’s not because they are foraging for leftover food, it’s because they really want to take the trash out for you, but they aren’t giant robots made of metal so they can’t. 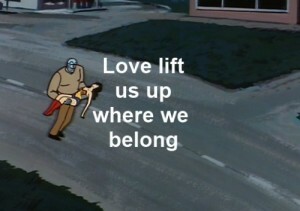 And we all thought Super Friends wasn’t educational. The Super Friends are alerted to the “eight foot tall robot monster” that is running loose. Superman and Wonder Woman take this emergency. They didn’t show it, but I imagine Aquaman had a meltdown about being scared of robot monsters so they let him sit this one out. Superman, always waiting until the last second. OSSUS throws an oil tanker at Superman. Superman ducks, and it goes flying past him. 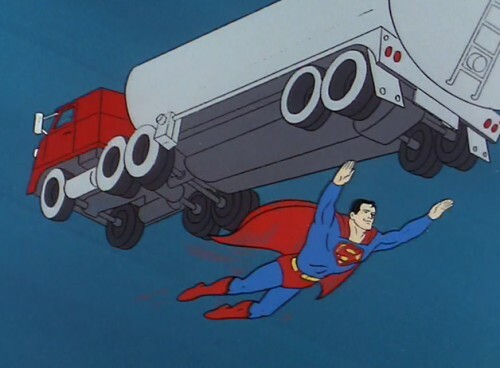 Instead of just turning around and grabbing it, he takes his sweet time, stops in midair, and exclaims, “I’ve got to get that oil truck before it hits the ground and explodes!” This must be why so many of my contemporaries are chronically late; Super Friends has never been good at demonstrating how much time it takes to get something done. This time, it’s Wonder Woman who’s the victim of gas. 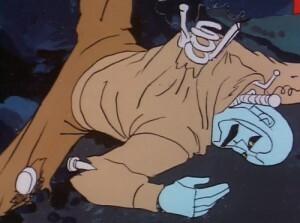 Last episode’s storyline A involved Superman getting hit with fear gas. This time, Wonder Woman has the terrible luck of lassoing OSSUS, who then staggers over and ruptures a gas line that just so happened to be in his way. OSSUS then picks up Wonder Woman and wanders off with her. OSSUS ends up back at the lab and Doctor Droid decides to transfer Wonder Woman’s brain into OSSUS’ to increase his intelligence. Again, it’s a good thing Aquaman didn’t come along. 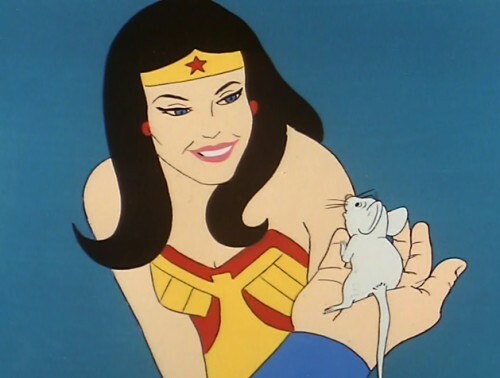 Superman shows up in the nick of time to save Wonder Woman from making the monster slightly smarter than a highly trained mouse. Wonder Woman and Superman split up – Wonder Woman chases after Doctor Droid and Superman goes after OSSUS. 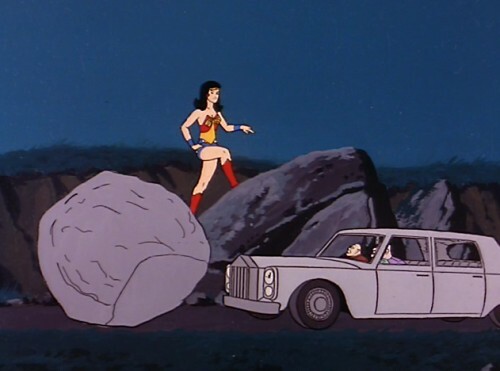 Wonder Woman blocks DD’s car with a lassoed boulder and also seems have grown a few feet. Seriously, I don’t think she could even fit in that car. Ossus plummets to his death from a cliff and this is where I inevitably feel bad for a villain who just doesn’t know what the hell is going on. Poor Ossus. For those of you who were worried. 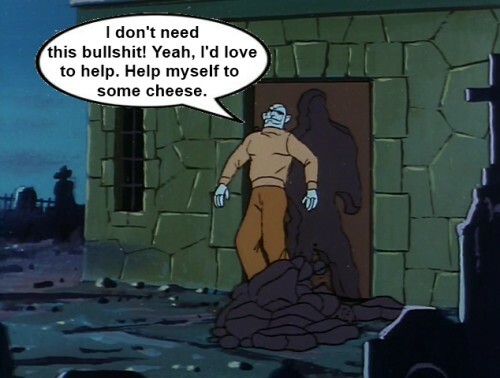 One reason I actually do love Super Friends is because they really go out of their way to show that no animals were harmed in the animating of their stories. That mouse? Totally fine. How? I have no idea, but I’m happy for him. By the way, that mouse looked really familiar. Wonder Woman looks like she is sort of enjoying interacting with that rope. this is a cool action episode despite the inanity. one small thing. we both know I’m a know it all musicologist prick….Up Where We Belong wasn’t written and released til 1982. I would have used Love Can Keep Us Together – Captain and Tennile or You Love Can Take Me Higher – Rita Cooliedge. both are crappy seventies songs before 1977.
i’ll go throw punch myself in the face now.. Yes, but: http://www.youtube.com/watch?v=lNfyhvlVLx0&feature=fvwrel …. which must have been an homage to this Superfriends episode? Hope everybody’s having a great Disney time! Ha! I’m usually pretty picky about the song dating. I just hope there’s never an episode where I could use Muscrat Love. I understand the whole man will never have to work appeal, but think for us? Who wants a bunch of mice thinking for us? Oh wait I get it. Dr. Droid must have already had the mice thinking for him which made him think that having mice think for us was a good idea. It’s so clear now. That does make sense. Or, Dr. Droid is himself a robot with the mind of a mouse. But then, who made him?